There are rumoured to be a couple of loopholes going into 2019 with these new regulations. So astounding that 2009's double diffuser will look like nothing! From what I have heard so far, the out-wash front wing will live on. And live on strong at that. It is said the teams already recovered 2018 levels of down-force in the wind tunnels. The benefit of less out-wash is still as intended however, it's just not as low as FIA wanted it. Insiders believe that one or two teams have found a bigger loophole to take things even further and have created some never before seen flow structures off the front wing to make even more down-force over the car. As a viewer I don't know if this is good or bad news, it would depend on which team exploited it. I hope it's a mid-field team. The extra downforce doesn't surprise me, the wings got bigger, the trinkets are gone, but the wing is bigger and taller. I'd be surprised if the cars were slower. The outwash... i was told by people more knowledgeable than me that with the old rules you needed to push the air far and wide to avoid the tyre, with the new rules not so much, but still there may be benefits. I feel rules about the endplate will be crucial, is a shorter endplate still allowed? If it is they can shape the wing to push air out and avoid the tightened rules for endplates acting as a block. As I've pointed out before, producing more downforce from the front wing has not been an issue since 2009 - balancing that at the rear is the problem. A bigger rear wing means they have freedom to generate a bit more downforce at the front... not that they can use it with the tyres overheating so easily. I think the fact that they effectively used a significant portion of the front wing to set up flow structures around the front tyre rather than pure downforce production is the key. They couldn't use all of the front wing because they couldn't balance the downforce at the rear. Im pretty sure that the wing elements themself will be shaped to create the outwash, and that the endplate will be smaller, so it wont block the air being forced outwards by the wing itself. We already saw this concept on the Ferrari 2019 prototype wing. As for the rumored "bigger than doubble decker diffuser" loophole, I don't see that happening. 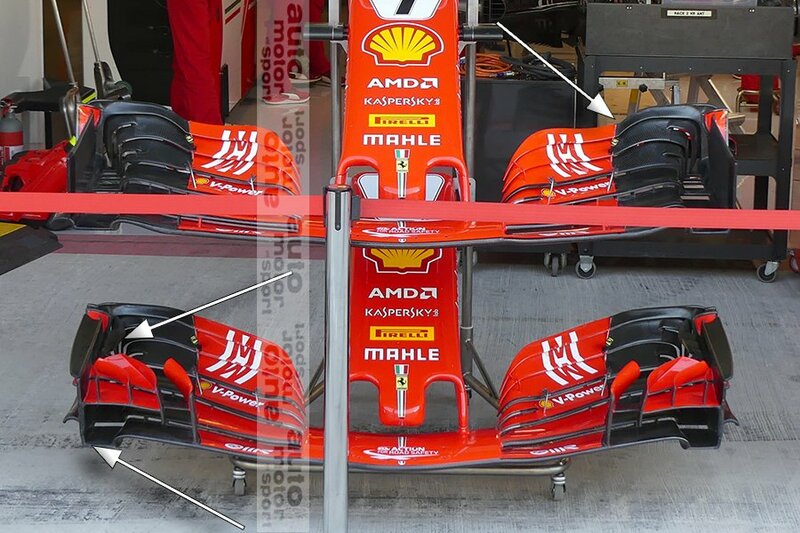 That Ferrari wing was just the 2018 wing with the cascades removed, that endplate/footplate is very illegal in 2019. The Williams and Force India wings from Hungary are closer, but I think both were still illegal. 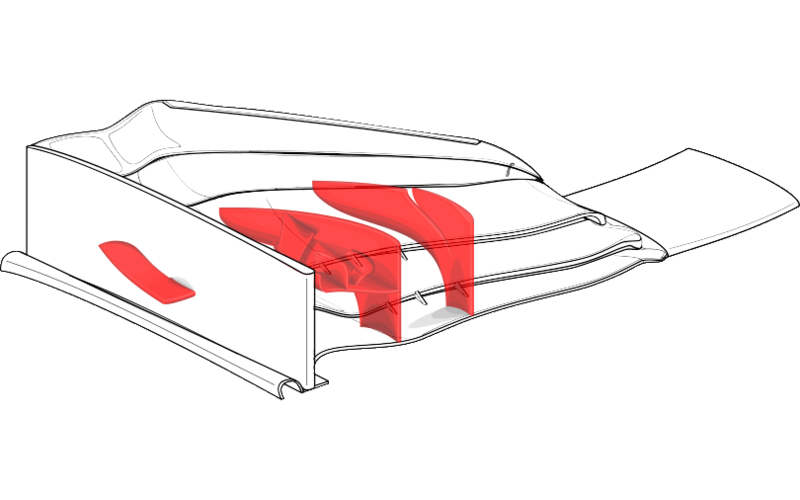 The endplate has to be defined from a surface - the virtual endplate surface (VES) which has to extend to the limits of height and length of the wing box - this surface has to be covered by the endplate and footplate over 95% of it's area. The elements then have to meet the VES at an angle no greater than 15deg from the vertical and cannot extend outboard of the VES. So there is some scope to channel some air out using the tip of the wing, but not much. Does the wing flap element have to be consistent in chord length? One might use a notch or some other geometry inboard of the endplate connection to generate a strong vortex, for example. This might be more effective if it causes a vortex that runs along the inside face of the tyre. The Williams test wing looks to be trying to do just that using a notch and the flap adjuster as a fence/strake. I think the flap adjuster can split the flap like that Williams example, but I think the creative leeway in this region is limited. ...Furthermore, the maximum deviation for any point of these profiles between the uppermost and lowermost angle of adjustment must not exceed 35mm. Minimal exceptions to the geometrical criteria for the wing profiles may be made in the junction between the adjustable and non-adjustable parts, in order to ensure the necessary level of sealing. So, as I read it, you can effectively create an <35mm tall wedge to seal the split between the adjustable portion of the flap and the static portion. Let us not forget the bigger rear wings! See where I am going with this? The retraction is much bigger for next year, enough that it can be a true aero surface. Some teams did come out towards the end of the season and say they had to re-configure there targets for next year based on rumours in the paddock. I guess there is a chance that the rumours were of a loophole and not just other teams DF levels. Which part do you mean? Sorry. Bigger than Double diffuser seems a little bit unrealistic. The DD was really really powerful. Though i can imagine that there are some loopholes in the completely new written parts of the rules concerning the frontwing. We will see if there will be any clarifications from the FiA prior to or during the pre-season testing. Regarding the bigger rear wing and the twisted enplates. Will be interesting to see how they can use that bigger twist. The width of the twist should be about the width of a monkey seat now. And if you can make it work you will get two of them. However i think there is a rule concerning the width of the endplates in a cross section taken parallel to the reference plane. So you can't add a horizontal wing element. But you could add slightly angeled element that is really shallow (like the front wing elements). It wouldn't provide much stiffness and would not be able to deal with the downforce coming from the main rear wing. Thus you would need to reinforce your Swan neck support. The 2019 car launches will be very interesting. It will be very exciting to see what consequences the reduced (or maybe not?) outwash from the front wing has on parts further down the car.